As I suffered through the post-op discomfort of a fifth and final jaw reconstruction surgery in February, it dawned on me. God’s designs for my last years as my church’s lead pastor differed greatly from my deepest desires. 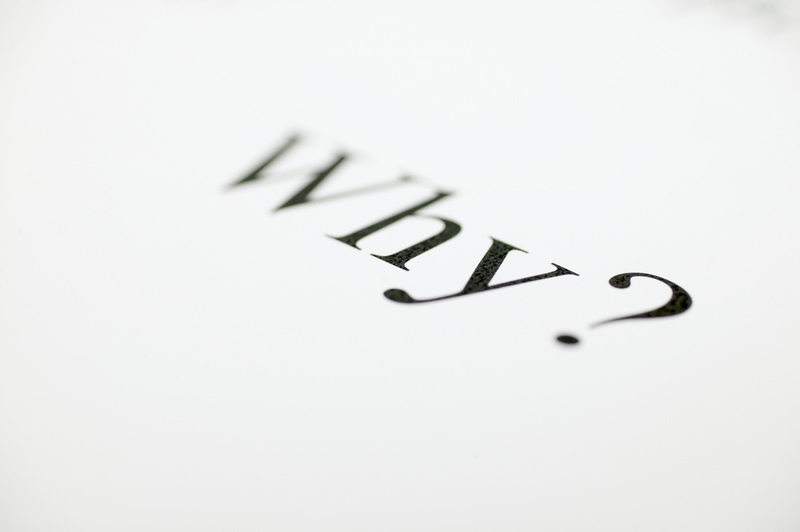 Who longs for a stewardship of loss, suffering, and pain? Nobody in his right mind. Ernie Johnson didn’t. A friend of mine sent me his video story suggesting we share a lot in common. He was right. See for yourself. For a more detailed version, watch here. My hope for the end game was to lead from growth, gain, and mission. Instead providence scripted the opposite. I’ve buried a son and a wife. I’ve endured a pathological fracture of the right mandible due to osteonecrosis from radiation for head and neck cancer. Jaw reconstruction has involved a total of five surgeries in Miami, a bout with osteomyelitis (bone infection), speech therapy, loss of all my bottom front and right side teeth, chronic drooling, impaired swallowing, and thousands of dollars of medical and travel bills not covered by insurance. I’ve been in and out of the pulpit so often and so fast I’ve got chronic whiplash. While recovering from the latest surgery, something else hit me. This year likely brings yet another loss–the end of nearly a two-decade investment in ministry at my church. It’s time to pass the baton to a younger man. I have no doubt. It’s my idea and God may well have a successor on the immediate horizon. Talking about succession the last couple of years didn’t faze me much. Theory is like that; reality is not. I didn’t feel the loss coming. But now I do. I hope to navigate this loss like the others–with the help of God’s grace–as I have often blogged about in the past. I read about the big succession announcement in the E-news and heard about it last night at community group. Woah! I am selfishly so sad that you all are phasing out, but I feel like I can resonate on some level . . . and that I should be unselfish and rejoice with what God seems to be doing. Praying for you guys as this next year sounds like it will be filled with many changes and mixed emotions. Last night in community group, and the last few times, people have mentioned in conversation how much your sufferings have impacted their spiritual walks and worship of Jesus as they have watched the grace of God as you have walked through such hard providences. It makes me wonder if your lives as a living sermon illustration are the most powerful, though the most painful, sermon you could give. I have heard it said in community group multiple times how much power of the Spirit has come in your preaching over the past few very hard years. I think it all has been and is doing more than we could ever know this side of eternity. Praying that God encourages your hearts in this season. That note goes in my “Why I Became a Pastor File.” A great reminder to say “yes” to the unscripted. Question: How has God used the unscripted in your life to advance His purposes and grow you spiritually? Let it not be imagined that the life of a good Christian must be a life of melancholy and gloominess; for he only resigns some pleasures to enjoy others infinitely better. The apostle Peter, writing to believers suffering severe persecution, would concur with that sentiment. Consider his words in 1 Pet. 3:8-12. Know anybody who does not want that? Nobody in his right mind wants to hate life and see bad days. We all want the best life has to offer. Few things can threaten a Christian’s sense of happiness and well-being like their church imploding with conflict. The summer our church melted down I recall for many among us at OGC as some of our worst days. Loving life fell far short of how any of us would describe our experience. If King Solomon got it right in Prov. 17:14 (and of course he did)–“The beginning of strife is like letting out water, so quit before the quarrel breaks out.”–then heeding Peter’s advice here makes a lot of sense. The best church fight we will ever have is the one we never experience. We all have to get equipped with this kind of strategy particularly as it pertains to countering evil when it rears its ugly head in our relationships. I will warn you up front. The strategy prescribed here flies in the face of the world’s approach. This is a distinctly counter-culture way to fight for the good life. But Peter has been arguing ever since 1 Peter 2:9-10 that, based upon who we are as God’s chosen race, royal priesthood, holy nation, and treasured possession–based upon these extraordinary appointments of grace–we must make certain radical commitments. We must determine to conduct ourselves in strategic ways with God’s help in all kinds of places–from the state, to the home, and now, wrapping this section up with Finally in v. 8–the church. Here’s the main idea I think he is saying: Our extraordinary identity as God’s people calls for radical peacemaking commitments in the church. There are three. They are showing grace (8), refusing revenge (9a), and giving blessing (9b-12). Future posts will unpack each in the interest of loving life and seeing good days. I dealt with considerable pain from my tongue cancer and its treatment back in 2005. But it doesn’t compare with my experience these days enduring a pathological fracture of the jaw. Pain which never lets up brings a whole new series of challenges to redeeming suffering as a follower of Jesus. Knowing I would have hours of windshield time to and from Miami last week for the consult with the surgeon there, I did a search online the day before I left. I wanted to download some resources/messages on the subject of pain. The Lord reminded me of Joni Eareckson Tada along the way. If anyone would have words of wisdom about dealing with chronic pain, she most certainly would. I had no idea just how right that impression from the Lord would prove to be. Of the half-a-dozen or so talks to which I listened on the road last Monday and Tuesday, this one struck home with the most Holy Spirit force. Nancy and I just finished watching it together prior to my writing this post. Whether your story involves protracted suffering or not, I cannot commend more strongly this teaching from a woman who testifies authentically with the poet, “My suffering was good for me, for it taught me to pay attention to your decrees” (Psalm 119:71, NLT). Please, I plead with you, do your soul a mega-good. As soon as you possibly can, invest the mere thirty minutes it will take to view Joni’s message. My prayer is that every one of our covenant members at Orlando Grace would do so. Beyond that, of course, all the better. If the good people of Orlando Grace Church can possibly summon the patience to wait AGAIN for this pastor to struggle through what feels like his thousandth sorrow, I hope eventually to return to them a better preacher and pastor. Lord, I believe, help my unbelief. For my readers not enamored by the likes of D.A. Carson or Tim Keller or even my beloved John Piper, I ask your indulgence through viewing this video. I wept and prayed as I watched. I know. I don’t look very miserable in this picture. That was a good day coming forth from hyperbaric O2 therapy number whatever for deep wound treatment to my radiation-decimated jaw. 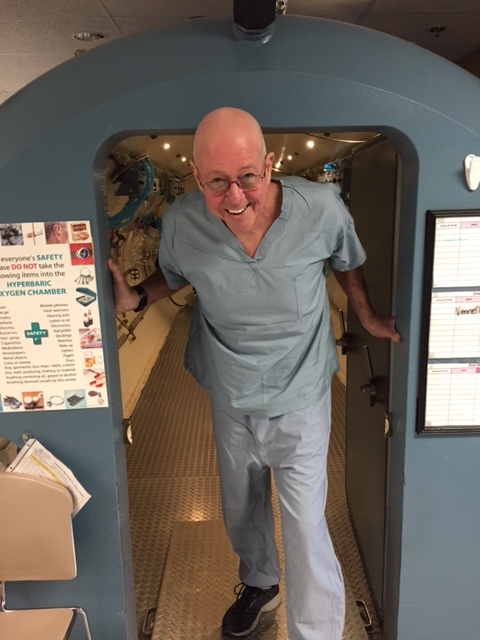 I managed to prevail on the nurses’ good graces that day to get some pics from the bowels of the compression chamber so others could have some idea of what my new normal looks like these days. I’m not hooked up here, of course. There is no O2 flowing. 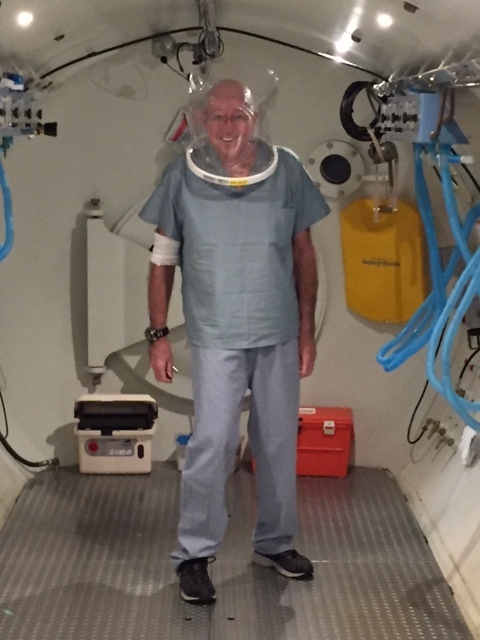 But this gives an idea of the rig I have to wear as a delivery system of 100% O2 for three thirty-minute periods, five times a day at Florida Hospital South. All sorts of fun. So far I’ve navigated twenty-one of these. Nineteen to go. The adjustment hasn’t gone all that rough. I read a good bit of the time now. Apart from the occasional nausea bout, things go pretty smoothly. Unfortunately I don’t have much progress to report. Hence my word “misery.” This past weekend my pain spiked. I cut church. If you know me, I never want to give up a preaching opportunity and chance to worship with God’s people (Heb. 10:24-25). Oops. I probably should have put them in the opposite order. Oh well. Sunday is the best day of the week, by far. I am thankful for an extraordinary pastoral intern who stepped in for me at the last minute. You can listen to his message here. With the pain spike came a fever on Sunday night. OK, now I’m getting nervous. Long story short, after consulting my dentist, infectious disease doctor, and oral surgeon since then, we have a unanimous verdict. Off to the hospital I go. It’s time to circle the wagons and call in some big gun consultants to play what-do-we-do-with-what’s-left-of-this-preacher’s jaw. The idea is to get my pain under control. I’m all for that. Then to get me hydrated and built up nutritionally. Not only can’t I eat; I am also having difficulty swallowing. It hurts that much. Then, Lord willing, next week they will operate again to remove more dead bone and hopefully save the jaw. I’m not kidding on that one. If my mandible gets a pathological fracture, I’m looking at some sort of radical replacement surgery I DON’T EVEN WANT TO THINK ABOUT! Has my sense of urgency come across the page? Please pray for mercy for me in this regard. I have read about this procedure. I would really rather avoid it, if at all possible. But if I do, my mandible mentoring, miserable as it might be, will continue with sovereign efficacy. God wastes nothing in our suffering, whatever its nature. In hard providences like these, I remember verses like Psalm 119:71. This slow learner apparently needs an extra dose of afflictions that he might learn all the more the treasure of treasures, the law of the Lord. Mentor me, oh my Master (and I don’t mean my mandible, but my mandible-maker), but please, I beg of you, go easy on what’s left of this poor man’s miserable jaw. Amen.